We have been re-accredited as ‘Gold’ by Unicef UK’s Rights Respecting School programme as a result of our continued commitment. 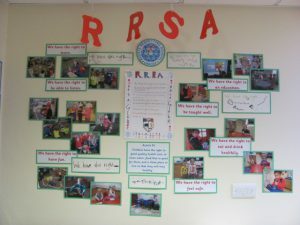 Click here to find out more about our RRSA work. We are an Expert Learning Centre for Global Learning. 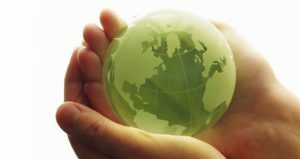 To find out more information about The Global Learning Programme please click here. The whole school community including members of the school council are involved in planning and implementing ideas. Our school believes that it is important to help the children to follow a healthy life-style. To do this we work hard within the school curriculum and also with extra-curricular activities to encourage the children to eat a balanced, healthy diet, to take exercise and to understand the importance of being a happy person. Our Personal Social and Health Education (P.S.H.E.) curriculum teaches children about wellbeing both physically and emotionally. We complete units of work on themes such as ‘New Beginnings’, ‘It’s Good to be Me’, ‘Going for Goals’, ’Relationships’ and ‘Changes’. We also carry out work with children on Drug Education, Internet Safety and Anti-Bullying. We participate in a lot of themed work during Anti-bullying week, including work on cyber-bullying, in November each year, to teach children ways of interacting with each other, what bullying is and what to do if you are being bullied. Our school takes bullying very seriously and throughout the year looks at ways of promoting positive relationships between all those at The Glebe Primary School. We are currently working towards Anti-Bullying Accreditation. Pupils are actively encouraged to: Drink water during lessons to help keep them fresh! Exercise during P.E. lessons, clubs and using small and large equipment during play times and lunch times. Eat healthy lunches and taste new products from our salad bar. Receive training, facts and gain awareness from specialist people to help keep them healthy and fit. 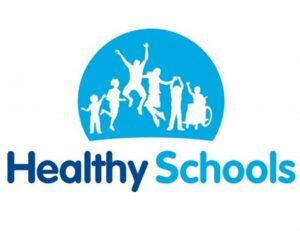 Part of our Healthy Schools Programme is to look at ways we can improve the way that children feel about school and its surrounding areas. The school council and our parents association, the Friends of The Glebe have fundraised to purchase playground equipment, sculptures of children’s work and artwork to enhance our school grounds. We have two pedestrian shelters to encourage parents and children to walk to school, (no matter what the weather!) and cycle racks for children in year 6 to use; after they have completed the cycle training they receive in years 5 and 6. We have also recently purchased a scooter rack for children in Key Stage 1 and a shelter in the Key Stage 1 yard to protect the children from excessive sun shine in the summer months. Our children are doing at least two hours of P.E. per week. We have specialist sports coaches coming into school to work with different classes in sports including: Gymnastics, Football, TAG Rugby, Volleyball, Cricket, Dance and Netball. Children in Lower Key Stage 2 also go swimming. Any child that does not gain the minimum 25 metres by Year 6 are given access to top-up sessions in the Summer Term to ensure they reach the required standard. We also attend competitions run by North Shore Health Academy in a variety of sports, giving children the opportunity to participate in sport at a competitive level and against children in different primary schools across Stockton.